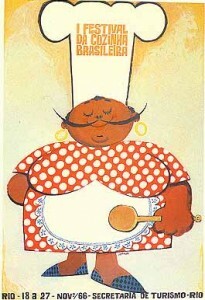 Ziraldo poster for the Festival of Brazilian Cuisine, image by www.ziraldo.com. RIO DE JANEIRO – An exhibition of posters by Brazilian cartoonist Ziraldo opened on October 9 in Mansão Figner in Flamengo and will continue until November 1. 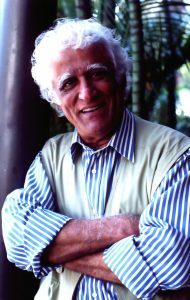 Ziraldo is one of the most celebrated living Brazilian artists, famous for his cartoons which have been published in books and also appeared on television as series for children. Since the beginning of his career in the 50s, Ziraldo has produced over one thousand posters. It is this side of his formidable artistic output that the exhibition seeks to explore, as well as offering the public a glimpse of the newly-published book on the same subject, also called ‘Ziraldo em Cartaz’ (Ziraldo in Posters). The 300 posters in the book will appear in minature form on a panel in the exhibition and will be accompanied by thirty original posters in the 60 x 80 centimeter format. All of the works were created to advertize cinema, theater, shows, plays and educational or political campaigns. The concept for the book occurred to the artist in a conversation with a literary agent friend. They approached designer Ricardo Leite about producing the book and specifically informing the reader about this lesser-known side to the artist’s oeuvre. Leite was also invited to curate the exhibition of the posters. The posters are of sentimental value to Ziraldo because they were commissioned by an agency in one of his first jobs. As well as providing financial security early in his career, they also inspired him to dedicate himself to making a living solely as an artist. Ziraldo also recognises their historic importance, as many of them register important moments in the country’s history. “It’s difficult to say which poster is the most important. The most well-known is ‘O Galo’ (The Rooster), that I made in 1966 for the ‘Festival Internacional da Canção Popular’ (International Festival of Popular Song). It was there that various giants of popular music got their first break, such as Chico Buarque,” Ziraldo says. “Among the posters is that produced for Os Mendigos (The Beggars), Cinema Novo‘s (Brazilian New Wave’s) first comedy and one commissioned by the Ministry of Health in 1980 for their anti-smoking campaign with the famous slogan Fumar Fede (Smoking Stinks)” he adds. The latter won Ziraldo various international awards and inspired him to give up the habit himself, after forty years of addiction. Apart from the posters, the exhibition will also include photographs of the artist at work in his studio in Rio’s Lagoa neighborhood. In a multimedia room, the public will also be able to watch a documentary on Ziraldo’s life and career. There will be guided tours offering commentary on the posters’ social function and the history of graphic arts in Brazil.